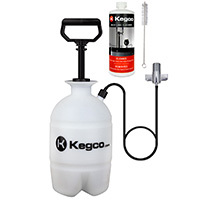 Introducing the Kegco Deluxe Hand Pump Pressurized Cleaning Kit! This convenient kit helps save the life of your tower without requiring you to remove the faucet. Simply unscrew the beer line off of the keg coupler, and screw this directly to the cleaning kit. Includes a High Pressure Hand Pump Cleaning Bottle, a 32 oz Bottle of Kegco Beer Line Cleaner, and a Nylon Beer Faucet Brush. The 1/2 Gallon Cleaning Bottle holds plenty of cleaning solution for you to keep your draft beer lines clean. The 32 oz. bottle of biodegradable Kegco Beer Line Cleaner alkaline solution helps remove beer stone, biomass, organics and mineral deposits from beverage lines. Use the nylon faucet brush to keep your tap clean. Comments: Very easy to use; works great. Comments: Have had a kegerator for years. The cleaning of the beer lines usually required submerging the line in a solution of cleaner and forcing the cleaner through by hand. A brush was used to clean the ends of the line and we let the cleaner in the line for 15 minutes to clean it. Now with the pump I can clean the whole system very easily by just attaching the pump and forcing the cleaner through the system. Great improvement. Comments: The instructions were very easy to follow and the pressurized tool worked great. Comments: Well built, easy to use, I will be purchasing all future products for my kegerator from them! Comments: I bought a used kegerator from a friend that had never been cleaned. After cleaning with this kit the beer tasted great. I highly recommend it. There is enough cleaning solution included with the kit for several cleanings. Comments: Love it simple to use. Comments: This is a must have for routing cleanings. All you do is remove your beer line from the coupler and attach to this pump. Pump of some pressure and open your faucet. Saves you from having to disassemble your entire system to clean beer lines. Comments: great package everything you need was there. Comments: It worked very well and I am pleased with the ease of using it. Definitely recommend it.